For people with the chronic obstructive pulmonary disease (COPD), summer heat is not only uncomfortable, it can lead to dangerous complications. Extreme heat and humidity can worsen COPD symptoms, including shortness of breath and bronchospasms. Here’s a closer look at the problems you can encounter with COPD in hot weather, and how to prevent serious summertime complications. One of the primary complaints of patients with COPD is dyspnea or shortness of breath. When the temperature heats up, your level of dyspnea can sometimes be far greater than normal. Why is this? Extreme temperatures often result in stress to the entire body. If we think about how our bodies react to stress, we may be able to better understand the phenomenon of how temperature affects breathing. The body is always working to try to maintain a normal body temperature, which is about 98.6 degrees F. When we are exposed to extreme weather conditions, such as during the heat of summer, the body must expend extra energy to try to cool itself down in order to maintain a normal body temperature. This extra energy requirement causes the body to demand more oxygen. If you have COPD, you are already using much of your energy just to breathe, not to mention everything else that you do during the day. So it’s not uncommon to experience a greater level of shortness of breath when you are exposed to extreme temperatures. Your body is being forced to use more energy while it struggles to maintain your body temperature. Have you ever stepped outside on a really hot day and taken a deep breath? The result is often startling. For people with COPD whose airways are already inflamed and irritated, breathing hot air can lead to bronchospasm. During a bronchospasm, the smooth muscle of the airways (the bronchi) contract, which decreases the size of the airways. The resultant decrease in the size of the airways makes it more difficult to get air into or out of the lungs. Subsequently, you will find that it's harder to breathe and you may become short of breath. It's not just the summer heat that's a problem. Elevated indoor temperatures result in increased concentrations of particulate matter in the air, which can worsen COPD symptoms. The same is true with outdoor air when air pollutants are present. Unfortunately, we know that outdoor air pollutants are associated with both COPD exacerbations and deaths. Drink Plenty of Fluids: During the hot summer months, you should increase your fluid intake regardless of your activity level or thirst. Water loss from the body (through sweating) can range from 0.3 liters/hour in a comfortable sedentary environment, up to 6.0 liters per hour with a combination of high heat and physical activity. If you don't compensate for this water loss with fluid intake, you can quickly become dehydrated. Wear Appropriate Clothing and Sunscreen: A sunburn makes it even more difficult for your body to cool itself, so be sure to wear a good sunscreen every day, even if you are not planning to be in the direct sunlight. Keep cool by wearing lightweight, light-colored, loose-fitting garments. Many people with COPD have deficient levels of vitamin D, so you may wish to apply your sunscreen (so you can absorb vitamin D) after being in the sun first for five to ten minutes. Plan Your Activities Carefully: If you have to go outside, do so in the early morning hours or after the sun goes down. When driving, park in shady areas and place sun protectors in your car. Choose air-conditioned venues and indoor activities. Stay Cool: If it is possible, stay indoors in an air-conditioned building (although getting outside for short periods of time, especially early in the morning or later in the evening, can be very healthy for those living with COPD.) If you don't have air conditioning, plan your day to involve going to places that do, for example, the library, a shopping mall or a friend or family member's home that is air-conditioned. Keep in mind that if air conditioning is needed for your health, you may be able to deduct this from your taxes with a note from your doctor. Take a cool shower or bath to lower your body temperature. Avoid activities that involve utilizing extra energy. Call your local health department to see if they can recommend a heat-relief shelter in your area. Use the Buddy System: During hot summer months, make sure to have friends or family members call at least twice a day to make sure you are OK. This is a good idea regardless of the season or heat. Avoid Excess Activity: You will be better able to tolerate the heat if you avoid strenuous physical activity or exercise during hot days. Again, it's important to note that exercise is very important for people with COPD and may not only improve your quality of life but increase your survival. Your best bet is to exercise in a place where air conditioning is available. 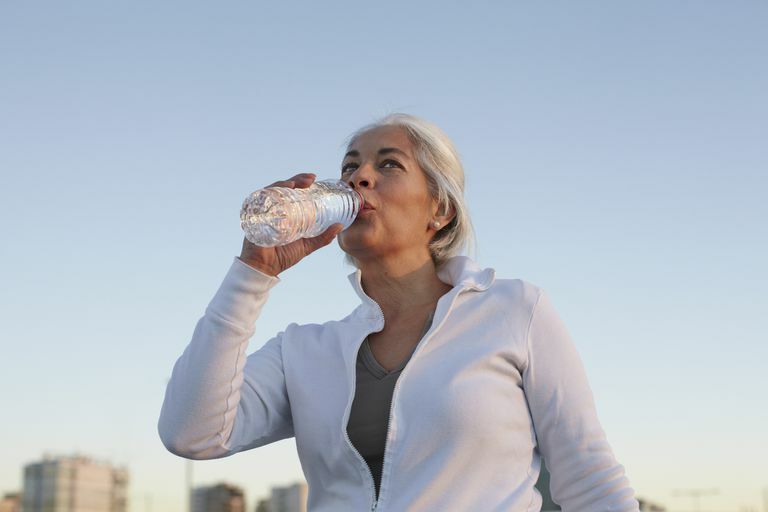 Make sure you get plenty of water since the combination of physical activity and heat further increases fluid loss. Take Your Medications as Directed: Remember to take your medications as directed by your doctor. If you use oxygen, talk to your doctor about your oxygen requirements during the summer months. Summertime can be a wonderful time to increase your time outside and exercise, both important for your quality of life. Yet taking a moment to consider safety in the heat and humidity is paramount. Keep in mind that your fluid needs can increase dramatically with heat, and dehydration can occur rapidly. Taking the few simple steps above may help you enjoy these months of summer to the fullest. Hansel, N., McCormack, M., and V. Kim. The Effects of Air Pollution and Temperature on COPD. COPD. 2016. 13(3):372-9. McCormack, M., Belli, A., Waugh, D. et al. Respiratory Effects of Indoor Heat and the Interaction with Air Pollution in Chronic Obstructive Pulmonary Disease. Annals of the American Thoracic Society. 2016. 13(12):2125-2131.